There has been a great deal of literary and critical work over the past few years dealing with native land claims and unceded territory all over Vancouver and throughout British Columbia, most recently around the 2010 G20 meetings and subsequent protests. For her part, Nicholson writes through and around Poplar Island, working from historical research, observation and an eye towards social justice, exploring what Dorothy Livesay famously called the “documentary poem,” providing a kind of poetic, historical and critical portrait of the island, its people and those who have impacted upon either or both. Her poem, quite literally, begins with documents on and about the space, exploring the genealogical traces of, as Jeff Derksen describes, “the history of use and ownership of a seemingly surplus space,” and provides an intricate collage of details, from lyric to historical correspondence to the cold fact of numbers. As she writes: “stand up now, the wasteland to maintain / your houses they pull down now / stand up now // your houses they pull down / to fright poor men in town // gentry must come down / and the poor shall wear the crown [. ]” Hers is not simply an uncritical description or documentary but one that speaks to the removal of various native peoples from their land for the sake of shipyards, and a long poem that does more than simply replicating information, but using that information to help shape a series of collage movements in the form of the long poem. 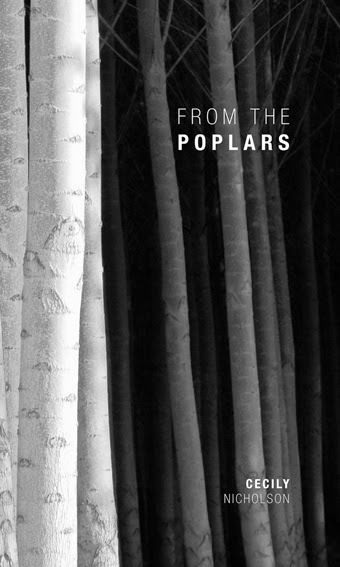 Purchase From the Poplars HERE.